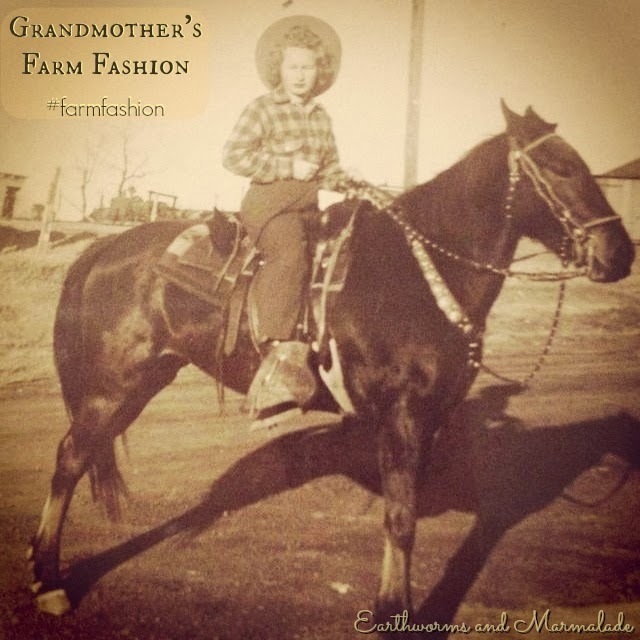 Earthworms and Marmalade: Farm Fashion: Function Meets Style and an Amazing Giveaway!! Your Farm Fashion might be a pair of great boots pulled up over your yoga pants, or it might have a more fashionable tone with pretty aprons and garden gloves. Whatever your style is, we want to see it! 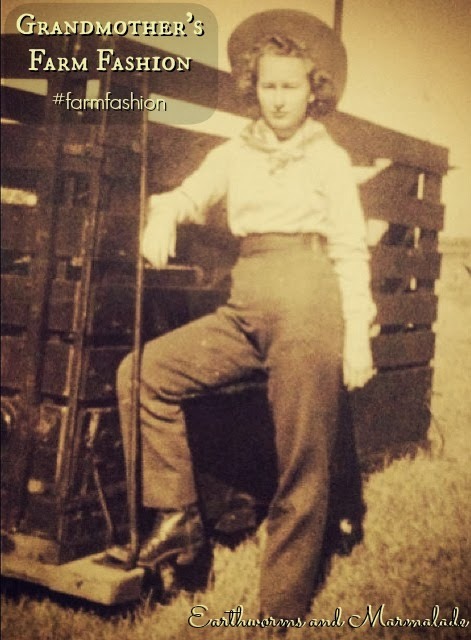 Share your Farm Fashion pics on Instagram at the hashtag #farmfashion. Standing at only 4' 10", my grandmother's style was strong, full of purpose, and also beautiful! Don't forget to check out all the awesome (seriously these blogs are amazing) sister blogs that are participating with us in the giveaway this month. So to enter just follow the instructions below and good luck! 1. Subscribe to the Earthworms and Marmalade Newsletter by entering your email below. You are free to unsubscribe at any time after this giveaway has ended. I will not share your email address with a third party. Your email address is solely used for the Jahner Farmstead Newsletter. 2. Click here to check out my fave farm fashion accessory and leave a blog comment letting me know what your go-to farm fashion looks like! The winner will be chosen via random.org. This giveaway ends at 12:00 AM on Tuesday, March 18th, 2014. The winner will be contacted by email, and will have 48 hours to respond with his/her full name, address, and phone number. There is no purchase necessary to win. This giveaway is open to US and Canadian residents!" Thanks for doing this giveaway, what fun! The black multi boots are clearly the cutest, but they have a terrible name. They need me on their team. Yes! They are super cute!! Oh, and my farm fashion has lately been snow boots, pajama pants, and my husband's giant coat, but I look real good when I'm feeding those chickens! :) When will it warm up in your neck of the woods? I super surprised we still have freezing weather this week!! Hi, I just found your blog and I am excited to find you. I'm not here to get into your drawing but to becoming blogging sisters and to glean from your gardening and canning experience. I'm a 68 year old retired grandma, who for the first time was a place in the country with a big enough yard to have an actual garden. This is my year to learn gardening and canning and I am over the moon excited about it. So happy to have found you, but I do not see a place to follow. Please come visit my blog an clue me in, I would love to be mutual followers. Fashion industry ordinarily dumps together two seasons together, Spring and Summer, Fall and Winter, which gives you about a half year to wear before it appears looks outdated. As a fashion buyer you work hand in hand with designers,here merchandisers and other key people to select what pieces to present to consumers and ensure that best-sellers are continually available. No longer are fashion events and content limited to fashion brands - today you see brands of all types leveraging fashion, ranging from title-owning Mercedes-Benz Fashion Week, Subway's runway dress made out of wrappers, Moët & Chandon on the Golden Globes Red Carpet to Intel and HP's multi-year long partnership with fashion-themed television series Project Runway. The expanding buying intensity of the white collar class has brought slants inside the compass of pioneers of the Indian culture. China Mall in Dubai Thanks for the article post.Really looking forward to read more. Fantastic. You are regularly ready to discover the sizes that you need that are hard to discover in a store and you can likewise appreciate a more noteworthy determination of the most prominent styles and hues. A decent standard guideline to remember while choosing your fashion wedding gems is the lower cut the dress,Anne Hathaway Skin Cream the more extended and increasingly perplexing your jewelry might be. In synopsis, free dress catalogs offer a fortune of ladies' fashion thoughts, a wide exhibit of styles and sizes, advantageous garments shopping, and the instruments for arranging an essential closet that is directly for you.